Product Engineering Services by Venture Mfg. 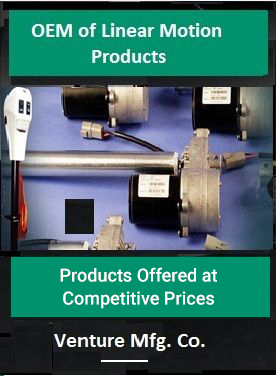 Co.
Actuators of various models are employed across industries to automate their processes, systems, and machineries. Taking into consideration a wide range of applications across industries, we at Venture offer product engineering services to create perfect linear actuator designs. Our product engineering capability is such that, we can work on complicated requirements with ease, in conformance to the customer’s specifications. Our manufacturing facility is equipped with designers proficient in CAD design software. They are capable of creating intricate designs by utilising the best features of CAD software. Starting from brainstorming to creating the conceptual design layout and detailed drawing, we exploit CAD technology to the maximum. Our CAD design centre greatly contributes in meeting the requirements of both prototyping and large production runs, in a short turnaround time. Moreover, the technology supports engineering actuators that are impeccable in functionality and durable in service. In order to engineer electric actuators the way you need them, we would also require details on the preferred screw type, housing type, wire length, among others. Once we receive all this information, we create a sample actuator design using CAD software. Using the design, a 3D actuator prototype is developed. The prototype with detailed specifications is then sent to the client for evaluation. Once we get the approval for the product design, we decide on the required resources, materials, production cost, and estimated delivery. The design is then transformed into an actual product in our manufacturing facility that is equipped with advanced machineries. Our workforce carefully executes each and every manufacturing process, leading to the delivery of the final product with unmatched quality. We have the team, facility, and technique to undertake prototyping or large production runs. We ensure to deliver the end product with expected quality for use in the harshest industrial environments. Our products engineering capability is unmatched in terms of creating intricate designs and final tooling that serve the demands of military, avionics, and power generation sectors, among others.